The LHM1000 Ethernet Converter is a Carrier Ethernet Service delivery unit, offering end to end management using 802.3ah OAM, and customer site conversion from twisted pair 10/100/1000BaseT and 100Base/1000Base-X fibre to HSSI Serial leased line services. 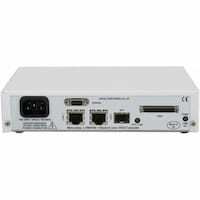 The LHM1000 is a switching media converter operating in store and forward mode. The LHM1000 supports auto-negotiation, and auto MDI/MDIX cross-over switching on the copper interface. To ensure reliable operation, the LHM1000 supports Link Loss Forwarding, whereby a fault on the serial port will automatically force a link down on the user ports to indicate to the attached device that there is a link problem. The LHM1000 supports the transmission of Mini Jumbo frames (2048bytes). The LHM1000 supports 802.3ah OAM which means that the Ethernet service can be managed and monitored right up to the customer delivery point. The future LHM1000 software development roadmap includes support for LACP, IEEE802.1ag and Y.1731 OAM standards. The LHM1000 is provided with an SFP module with LC connector supporting for example 1000Base-SX for 550 metres operation over multi-mode fibre, or 1000Base-LX for up to 10km over a single-mode fibre. The LHM1000 is ordered without an SFP fitted, although customers can subsequently change their interface type. Please contact Metrodata for price and availability of SFP modules including long haul, 1550nm, bi-directional and CWDM. The LHM1000 is available in a choice of 100-250 VAC or -48 VDC integrated power supplies. The LHM1000 can easily be rack mounted in either a 1U two unit rack mount kit , a 6U eighteen unit rack mount kit. The LHM1000 is part of a wide range of LAN extension products from Metrodata. This application shows an LHM1000 unit being used as the Ethernet demarcation device to deliver a Carrier Ethernet service from an MPLS core network. A wide choice of Ethernet connectivity is available for the user via the 10/100/1000baseT and SFP fibre ports. OAM support means that the LHM1000 can be remotely managed by the central network management system using standards based OAM packets. This application shows how a pair of LHM1000 units can be used to offer Ethernet service demarcation and LAN Extension functionality either over a HSSI Serial circuit.